The most advanced turn simulation software with Swept Path 2.0 technology. The third Wednesday of the month Transoft Solutions hosts a free, live AutoTURN Tips webinar for AutoTURN and AutoTURN Pro users and anyone interested in learning more about our swept path analysis solutions. These webinars are designed to encourage users to take advantage of all the tools and capabilities of our powerful swept path analysis software – to get the most out their time and their investment. Register for our upcoming webinars here. We encourage you to use the webinar recordings below as a learning resource. They cover a variety of basic and advanced topics and include an interactive question and answer period. Our webinar series is on-going and we invite you to attend every month. We encourage participation so bring along any AutoTURN questions that you may have. If you have any question or comments about the AT Tips Webinar we’d like to hear about them. You can contact us at webinars@transoftsolutions.com. Learn the different characteristics of standard and manufacturer-based models and when to use each type and how to create custom vehicles to match manufacturer specifications. Learn how to complete a vehicle swept path analysis using SmartPath Tools (ArcPath, CornerPath and Oversteer CornerPath). See how you can complete reverse maneuvers using the two AutoTURN methodologies: Push Method and the Pull Method. Discover how you can effectively check your ramp and driveway designs using the Grade Templates and Vertical Simulation Tools. This video shows you how to create custom vehicles and loads well as how oversized loads can be added to vehicles for envelopes analysis. Learn how to ensure your parking site or garage designs accommodate safe and efficient vehicle maneuvers. See how you can model multiple vehicle routes for site circulation analysis in less time using IntelliPath's artificial intelligence. 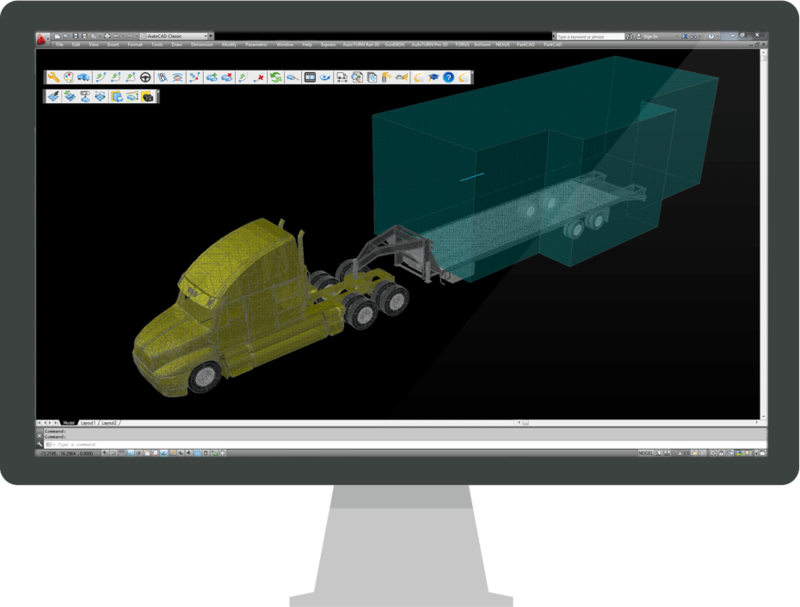 Learn how to use vehicle 3D modeling to perform terrain and overhead clearance checks to prevent costly damage to vehicles and infrastructure and analyze stopping distances using sightlines. See how vehicle 3D clearance analysis compares to 2D analysis and learn how to convert an existing 2D simulation into a 3D one.